So I’m about to go kayaking. I’m not sure what I think about an activity with the work YAK right in the middle of it. AND, we’re kayaking in an area called SALT MARSH. What the wonk is a salt marsh?! I’m sorry, but A-L-L-I-G-A-T-O-R is all I hear. On top of that, it’s a 3-hour tour. A THREEEEE-HOUR TOUUUUR. No one was rightly amused when I burst into song. So before I head off to climb into a kaYAK, fall out mid-row, drown in a marsh filled with salt and get polished off by 27 ravenous alligators in the Outer Banks of North Carolina, I want to show you this guacamole tuna salad rawl quick. Take an avocado and mash her up. 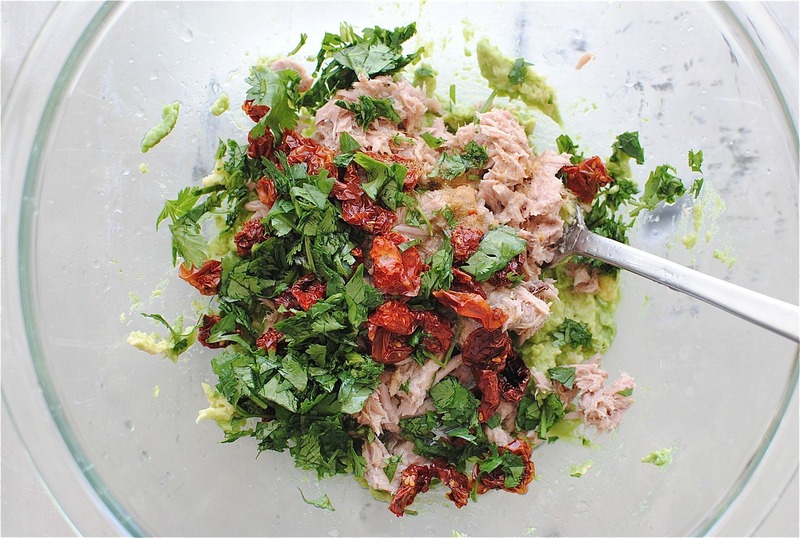 Add a can of tuna, some dehydrated tomatoes, cilantro, lime juice and cumin. Once you mix all that up, you add a handful of arugula or baby spinach or kale, whatevs. Throw in a pinch of salt, pepper and mix her up. 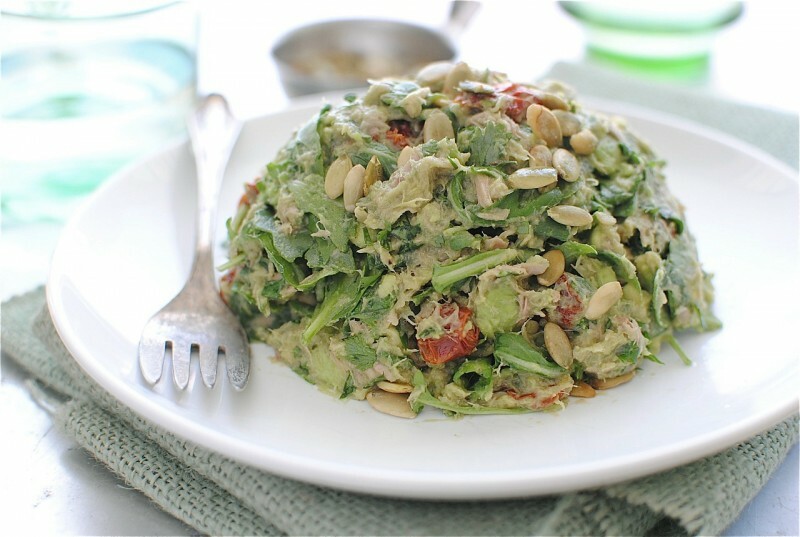 And then you make a cute little mound like this and top it with toasted pepitas. And then you simply stalk this tuna salad with 95% of your body under water, with only your beady eyes peaking above the water line, and then you’ll lunge towards it, violently snapping it with your jaw, applying a sick amount of pressure and swallowing it in one breath. Oh wait. Thaaaaat would be me. In a large bowl, mash the avocado. Add the tuna, tomatoes, lime juice, cumin, cilantro and pinch of salt and pepper. Stir to combine. Add the baby greens and give it another stir. Lunch just landed in yo’ face. *if you don’t like the idea of eating an entire avocado in one sitting, just half it. 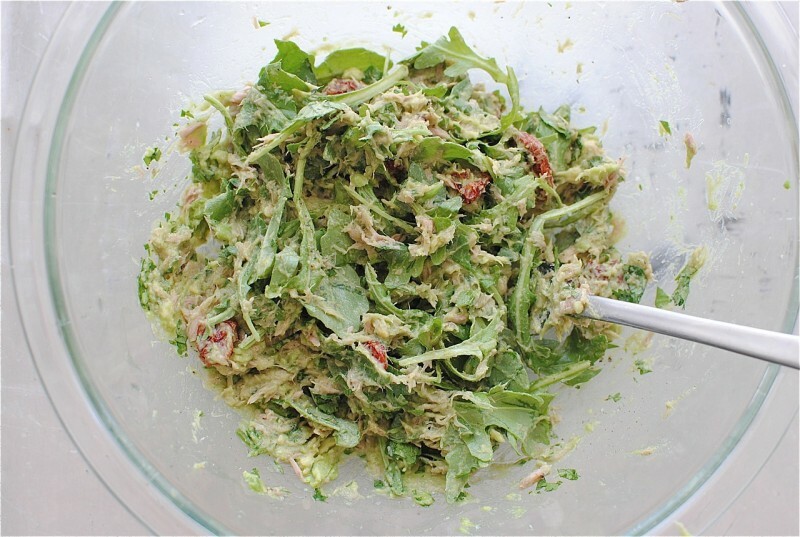 You should take this tuna salad along in your pocket and feed it to the alligators so they don't chomp on your face...but rather, your pocket full of goodie tuna. Or save it all for yourself, that's what I'd do. And am gonna do. This would go perfect on top of lettuce or in a sandwich! Stay safe. 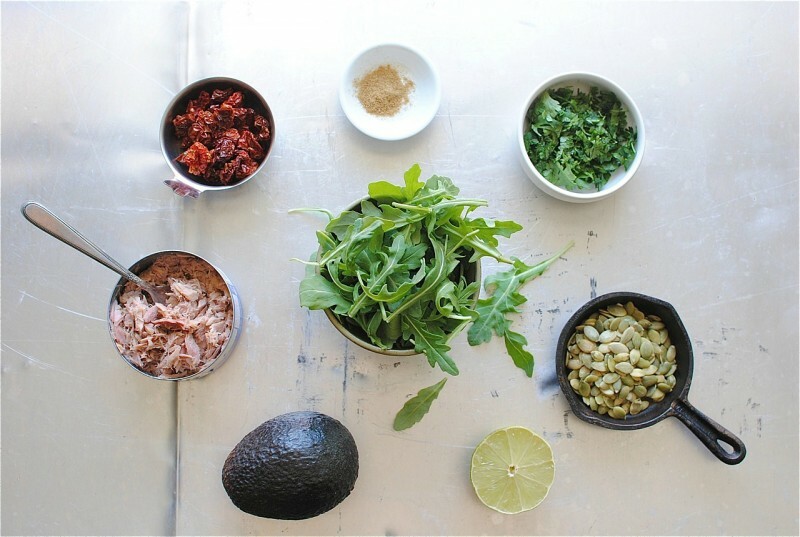 I LOVE guacamole and cannot wait to make this.... Perfect quick lunch! Pinning this to make soon. Who wouldn't want to use an ENTIRE avocado? May use two? and I certainly hope you aren't chum...oh wait, wrong horror flick. Got's my sharks and 'gators mixed up. End result the same tho. Looks awesome! I like the sun-dried tomatoes. Never had them with tuna! What a fun spin on a classic. YOU are a fun spin on a classic! I freaking love every ounce of this. And you. 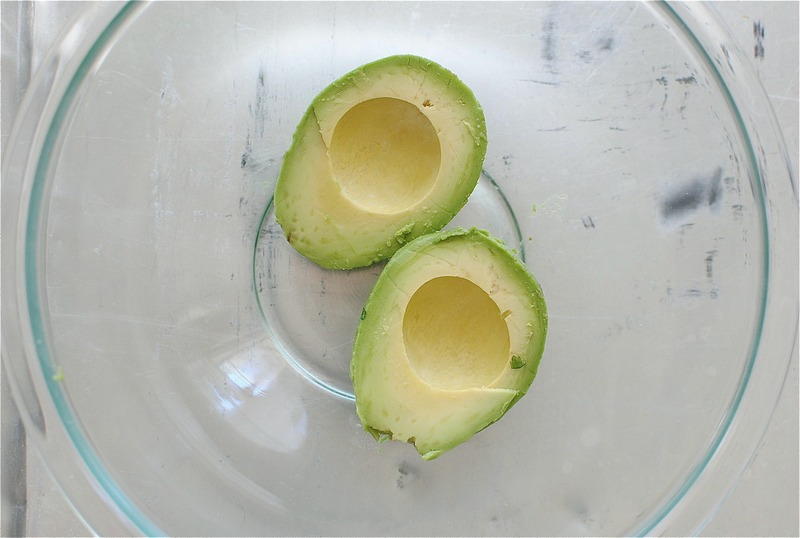 Wait, eating an entire avocado in one sitting isn't a thing? 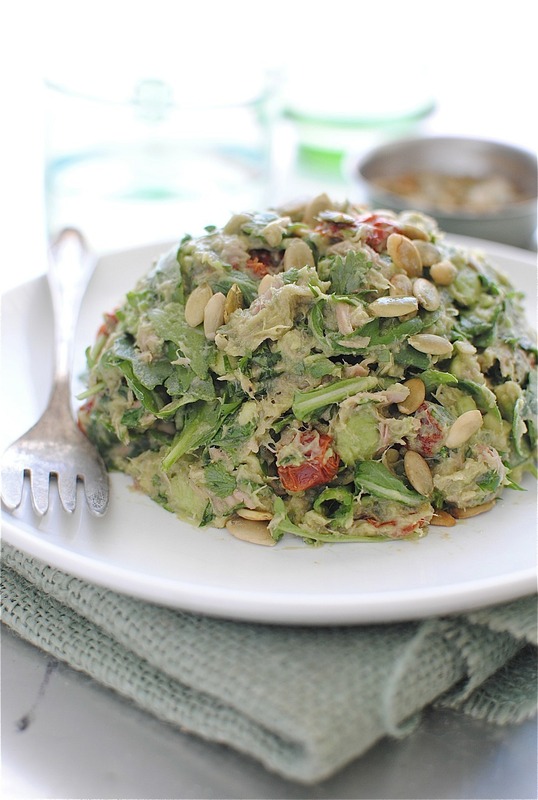 Ohhhh I like your version :) Love the sun dried tomatoes and greens! Good luck kayaking. Really, good luck. 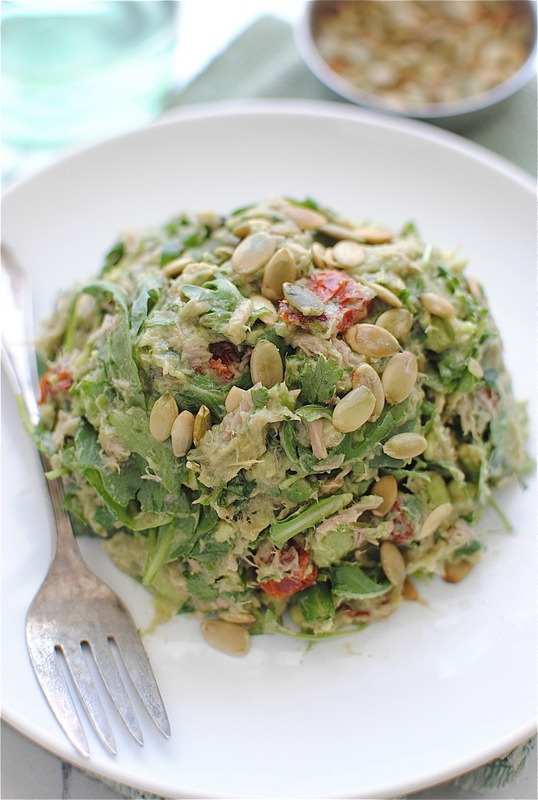 And why in the world have I never put avocado in my tuna salad before? Makes perfect sense. Holy moly, there's just so much amazingness in this! This and corn chips. Omgomg. Hmm ... inquiring minds... how can you make tuna salad on your fabulous blog, kayak in the outer banks and plan your would be funeral back in KC? he he Oh silly girl, its a blog and they are "e v e r y w h e r e." he he Cuteness. 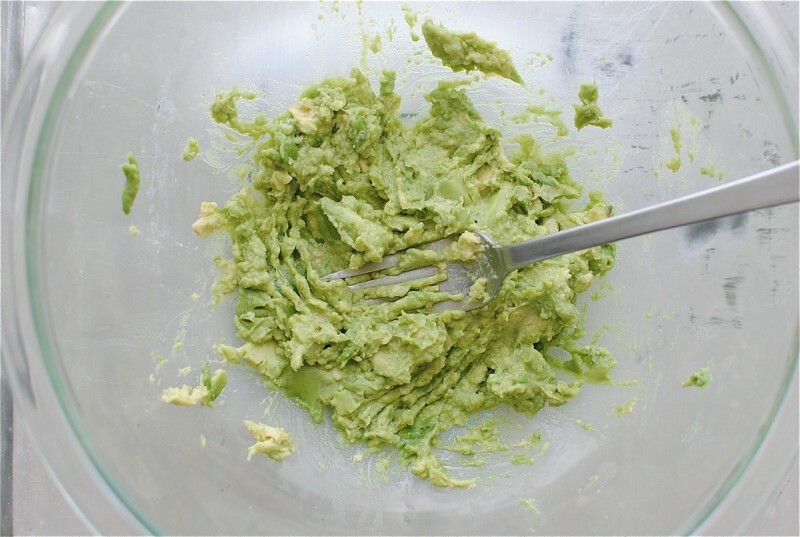 Holy Moly I so love guac and I think a good 'cado is like butta baby. Enjoy your adventure! Okay, I cannot even focus on the food because, if you had died in the waters, which thank goodness you didn't, I would have personally called Phillip Phillips to sing at your funeral! Now, back to the salad. It looks amazing! I enjoyed reading your blog post and had to make the salad right away. Made it last night and just enjoyed it for lunch today. I added a little salsa and used more greens and loved it. I will definitely make it often. So easy and a great way to stop eating tuna the boring way (right out of the can with my salad LOL). Thanks for the entertainment and the great idea. Thank you! My hubby hates avo, but I love it. Made this, and he didn't even notice the avocado! So....I didn't feel the need to tell him lol I also added a bit of natural greek style yoghurt to add creaminess. Delicious lunch! So I search tuna on Pinterest and your ridiculously funny blog comes up. I'm going to make this recipe now...but not before reading this again and laughing some more. Somewhere in between, of course is where you want to be. Then when somebody searches for those tags online, the search engine directs it to the website which has posted its content based on such keywords or tags. 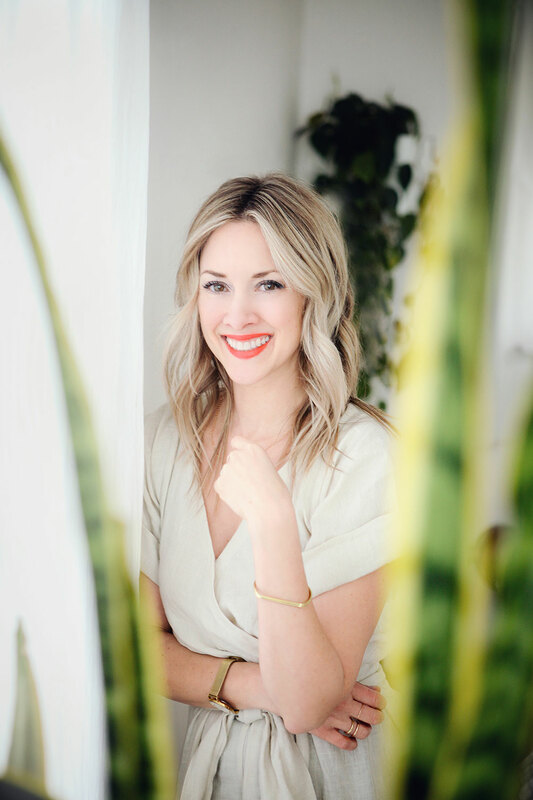 Now is the time that you get disciplined; as it is the disciplined marketer who will win the race - and that means setting up a schedule for yourself.